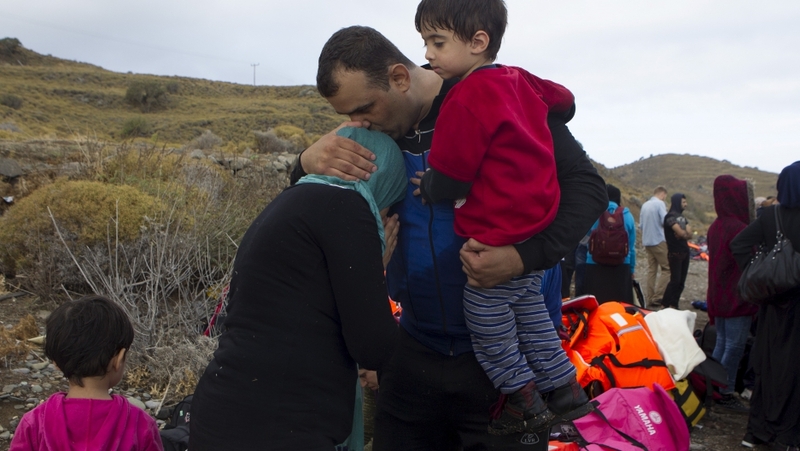 A Syrian refugee family embraces following their arrival on the Greek island of Lesbos after crossing a part of the Aegean Sea from the Turkish coast September 29, 2015. A record number of at least 430,000 refugees and migrants have taken rickety boats across the Mediterranean to Europe according to International Organization for Migration figures. The UN Refugee Agency, UNHCR, estimates 14 million people are "newly displaced due to conflict or persecution, including 2.9 million new refugees," making this one of the worst humanitarian and refugee crisis since World War II. The vast majority are Syrians, Iraqis and Afghans fleeing poverty, war or persecution and conflict at home. Nearly 500,000 have risked their lives crossing the Mediterranean in overcrowded boats, either to be rescued by the coast guard or to drown. In the midst of this chaos, there have been “many myths about migrants and refugees," says Jill Goldenziel, a research fellow at the international security program at Harvard Kennedy school. "Many people believe that overly generous rescue operations have prompted surges of refugees and migrants to come to Europe, and that&apos;s just not true," says Goldenziel who recently wrote "Five myths about refugees and migrants." "It’s human desperation that really drives migration and refugee flows." And contrary to the belief that the refugees are becoming a burden to Europe, Godenziel says, the evidence shows otherwise. Yes, the current flow is unprecedented but "Europe, with its aging population and need of workers and working age males, in particular, may stand to benefit from migration overall." Debunking these misconceptions, she writes, can lead to better policies to improve human rights.